Charges connected to the fatal shooting of a man in Nottingham have been dropped after a jury failed to reach a verdict. 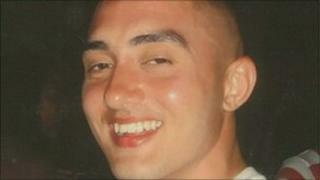 Bernard Langton, 27, of Bulwell, died from a gunshot wound after he was found in an alleyway close to the Pitcher and Piano bar on 25 May 2009. David Stokes, 29, from Colindale Road, Birmingham, had denied murder. At Birmingham Crown Court, the jury was discharged after several days of considering its verdict. This was the second time Mr Stokes had been tried for the murder with the previous jury also failing to reach a decision. On the night of his death, Mr Langton had been involved in an argument in a nightclub, which had resulted in him stabbing a man after being hit over the head with a bottle. He was shot outside but managed to stagger to a nearby alleyway before collapsing. Anthony Tirado, 25, and Dion Griffin, 35, both from Top Valley, Nottingham, were found guilty of murder in June 2010 and were sentenced to a minimum of 28 years. Det Ch Insp Kate Meynell said: "This has been a complex case which required in-depth analysis of CCTV and evidence from witnesses who saw what happened before, during and after Bernard was killed. "Everyone involved in this investigation has been driven by a determination to find his killers and deliver the justice that he and his family deserve."